In recognition of International Women’s Day on March 8th, Legacy International will be highlighting stories of our programs and alumni working around the globe to #PressforProgress. With the World Economic Forum’s 2017 Global Gender Gap Report findings telling us that gender parity is over 200 years away – there has never been a more important time to keep motivated and #PressforProgress. And with global activism for women’s equality fueled by movements like #MeToo, #TimesUp and more – there is a strong global momentum striving for gender parity. Gharsanay IbnulAmeen of Afghanistan (Emerging Young Leaders Award 2017), now 21 years old, has become a compelling voice for girls’ education and women’s empowerment in Afghanistan. 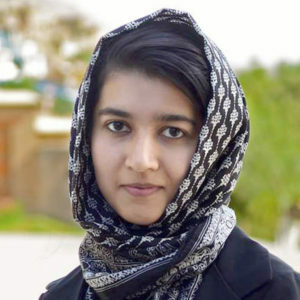 In 2017, Gharsanay was awarded the U.S. Department of State’s Emerging Young Leaders Award. 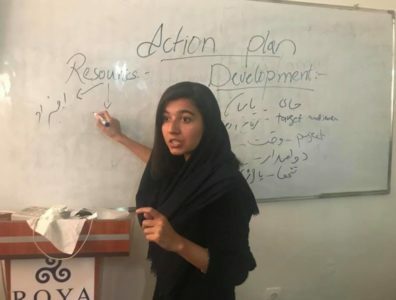 U.S. Embassies worldwide nominated individuals making a difference in challenging circumstances and Gharsanay was one of ten young people selected. h the Afghan Girls Sustainable Education project that aims to increase enrollment and decrease drop out rates. Over 100 ulema, tribal leaders and elders representing 21 districts from all over Nangarhar province have participated and she plans additional workshops in Jalalabad and then Laghman Province. Most recently, she and her team started Afghans For Non-Violence, which aims to use non-violent ways to combat extremism and violence. Gharsanay facilitation a session during the Young Women’s Leadership Conference in Afghanistan. Gharsanay understands the value of establishing partnerships with organizations such as SOLA School of Leadership (the first boarding school in Kabul for young school girls from across Afghanistan and ILD (Institute for Leadership Development, offering Leadership Courses for university students, both women and men). Currently, she is completing a law degree at the American University in Afghanistan and has helped develop a partnership between the American University of Afghanistan and American University of Washington D.C for Afghan-US Cross Cultural Communication Peer Learning. Gharsany wants to invest in her education so that her life plans can unfold and ultimately she can be elected to a government position and effect sustainable change for Afghanistan. Gharsanay is a tirelessworker who draws people in with her positivity. We honor Gharsanay and her tireless commitment to supporting women and girls in Afghanistan and around the globe to #PressforProgress.